I am sharing the following email from my trusted and honorable whose cousin is in desperate need of all the help he can get as his son on immidiate basis needs a liver transplant. Following text is his email consisting information of family, their bank account (to which transfers can be made), their contact details, the needed amount and hospital information. I am writing this email to request you to please help me in raising funds for my nephew Ali Shaheer. He is son of a very dear cousin and was diagnosed with Steatorrhea since birth. Jaundice since he was 6. He has terrible itching since he was 4. After ruling out several diseases the probable diagnosis is Progressive Familial Intrahepatic Cholestasis. Doctors have strongly recommended a liver transplant on emergency basis. Starting today we have two weeks approximately to raise fund for his operation which is planned to take place in India. Although England was the first choice yet due to financial constraints India has finally been selected as the place for the operation. I would be extremely grateful and indebted to you if you can donate any amount even if it is Rs. 500. Target is above Rs. 7 million so every rupee will count. The family has saved around Rs. 3 million. You can directly deposit donation to the account info given below or we can some other mean of transfer. ‘Fuztu Bi Rabbil Kaaba’ – Ameer Al Momineen Alehe Salam! These were the last words uttered by a person who is known in history with many titles i.e, Lion of the Lord, Wasir of Prophet, Khilafa e Rashid, Conqueror of Khyber. But most importantly and most personnel to my heart; Commander of the Faithful. There are many reasons to call him that. Historically speaking in those times commander of Muslim armies were referred to this title. Later it got exclusive for caliphs/ameers. Ali a.s being the first choice general of most of battles during life of Muhammad SAW and an agreed upon Khalifa e Rashid, is perhaps best suited for such title. But these I guess are not the main reasons for that. Ali a.s was and is an emblem of faith. 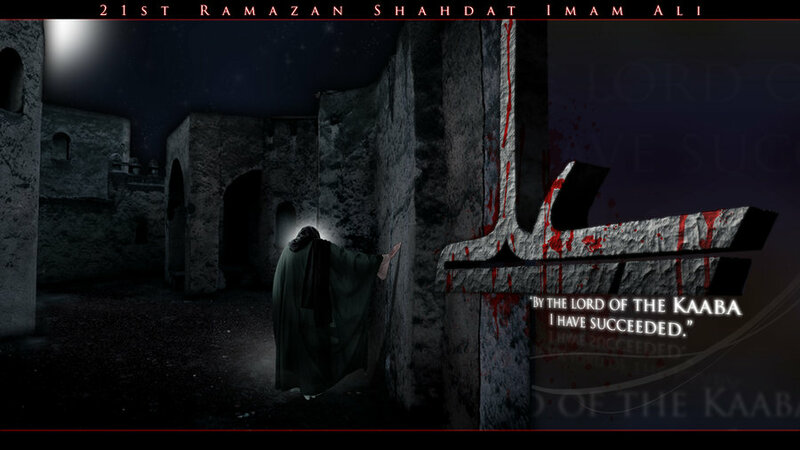 Whether it was time to show faith in Muhammad SAW when he was just a teenager in a gathering of elders of Bani Hashim, or the time of Khandaq when faith of many people got week due to fear of opposition warrior, or the time when he was struck with the poisonous sword which eventually resulted in his martyrdom, his faith in the message of Muhammad SAW and belief that what he was doing, was for the cause of justice and Islam, never shook for the moment. Not many people can claim such a thing. Perhaps this is the reason that when Ali a.s went on to fight Umr Bin Abdowad in Khandaq, Prophet SAW called him kull-e-eemaan. [Shakir 2:156] Who, when a misfortune befalls them, say: Surely we are Allah’s and to Him we shall surely return. Above verse was revealed in praise of Ali a.s when he was given the news of death of Hamza a.s, while fighting during the battle of Uhud, Without, deviating any attention from the battle itself, this is what he said. And I guess this pretty much summed up his whole life and the whole philosophy behind it and the reason why he went on to achieve such mairaj in faith. People do many things many times, just because they feel at that time that this is the right thing to do. They have faith in their judgment for that moment, but when the consequences of their actions retrieve disappointments and failures, they lament over their own decisions and actions. On the other hand, if our every action is based on the belief that we are doing this for Allah because he is the source of our life and in the end we will go back to Him, there will be no remorse. It is no wonder that during his whole life, there is no evidence that would suggest that Ali a,s lamented over any of his actions that he should have perhaps taken a different course of actions for any particular conflict. Although many Orientalists and Muslim ‘intellectuals’ over the history have showed their concern that perhaps Ali a.s could have avoided conflicts by being more ‘diplomatic’ in his approach. But the goal of Ali a.s was not to achieve diplomatic victories, but to establish justice, rule of law, or rather I should say rule of Allah in the land of Allah. The statement shared earlier is no ordinary statement. It is perhaps unique in its nature because such statements are not associated with Caliphs/kings. Many leaders of past civilizations spent their lives doing what they desired, but peace of mind and sense of doing the right thing for the right cause eluded them. It is not easy managing the affairs of people. Indeed pious rulers like Umar Bin Abdul Aziz r.a also used to weep often, while thinking what responsibility lay on their shoulders. If we see predecessors of Ali a.s, during their last times, peace eluded them and they wished they had been anything but humans. One even wished to be a goat so it could be eaten and drained/wasted by humans. As for many of his following successors, many of them were too busy playing with power sharing games and securing thrones for their jaanasheens, to be bothered about showing any remorse or even believing in it for that matter. Lord Acton said ‘Power corrupts people. Absolute power corrupts absolutely’. Ali a.s said ‘Power does not corrupt any person. It merely brings out their true color’. And indeed it brought true color of Ali’s a.s own personality to the world. There are not many people who can be called majestic and humble at the same time. His persona reflected royalty, while his dress code reflected humility. A warrior who was feared by many in the battles, while available easily for the general public. A charismatic ruler who did not bow down to pressure of friends and foes alike and who did what he believed in, because he believed he will eventually return to his Lord and answer him and that he did not owe answers to any other. If it is difficult to find any Caliph/King being associated with the earlier statement, it is without a doubt impossible to find any suitable candidate for this statement, if he endured the same conditions which Ali a.s faced during his tenure as a Caliph. Ali a.s had to face betrayals by followers, deceit by enemies, incompetence and ignorance of his soldiers, blackmail by the powerful ones, but still he never deviated from his duties. Any other person would perhaps have sought petty measures in order to appease people, or fierce ones in order to crush opponents while ignoring justice. Ali a.s maintained equilibrium of justice, while being questioned all the time about his true intentions, by friends and foes alike. He remained calm and sober. A trait shared by his son Hassan a.s, who was subject to many taunts in his life, but he also never lost his patience or the charitable smile. In times of distress, while Ali a.s lamented lack of help and ineptitude of his followers, he never for once lamented over any of the decisions or his strive for justice. That is the reason, he even did not lost patience in his time of death and as he proclaimed proudly ‘Fuztuu Bi rabbil Ka’aba’, he was happy and content with what time God had given him and the chance to serve his most favorite Prophet SAW. He knew he succeeded because perhaps he could see his master SAW coming towards him once again, to whom he had swore allegiance, to whom he always remained loyal, to whom he fulfilled all his promises. He got martyred and by the time people realized what had gone last and what ad replaced him, they could not do anything about it. Ali a.s became a legend. A hero who was glorified through poetic rhymes and whose death was lamented by those who cherished his generosity, honesty, piety, valor and above all, his faith. His heroics got a special place for him in history, poems and the hearts of believers. Unfortunately, while many got attracted to his charisma, not many got his real message. The battles fought in his era were hushed up under the tables while conversations and sirens of mosques. Critical study and analysis of his era got limited to biased approaches. If people had looked into his era objectively, many of problems of today’s corruption, extremism and terrorism could have been dealt with in an effective way. But preset minds and close hearts perhaps will not allow that for some time at least. However, it does not require deep analysis committee to understand the very simple essence of Ali’s a.s life which he himself mentioned. The faith that we are from Allah and to Him we will return. [Shakir 2:157] Those are they on whom are blessings and mercy from their Lord, and those are the followers of the right course. Hail the emblem of faith! Hail the Commander of Faithful! Assalmaolaika Ya Ameer Al Moineen, Assalmoalaika ala Yasoob e deen.